First what I thought I was going to do. I'll probably machine applique these angels on some other piece -- they are cute. 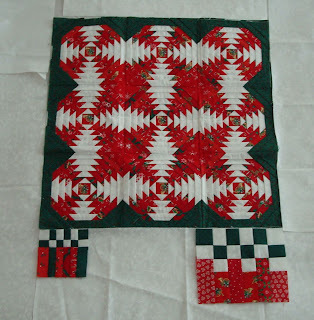 Here's the whole piece with the 2 sample pieced borders. I made a mistake on the first one as I really like the 9 patch look of the second one. But, this was enough to get an idea. I will have to put a spacer border in to make either of these borders fit. I'll figure that out later. Here's a close-up of the tiny border. Those strips are 1/2" finished. (Am I out of my mind -- this would take forever! 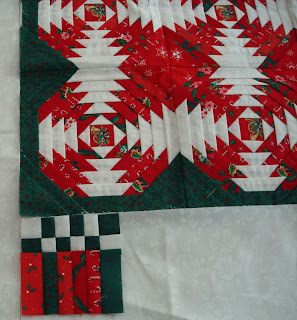 And finally, the border strip bigger and with the 9 patch look. I had to really think about how Judy Martin did this in the book. This one is my favorite. I only have a bit of the white left. I'll probably have to add another white from the stash to get all the white squares done. 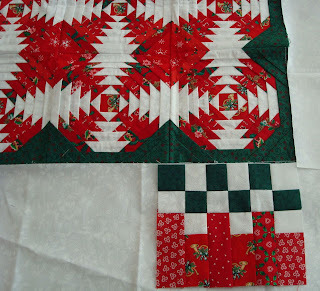 And, I'm wondering if I will have enough of these older red christmas prints. I would love to use them all up! This might become a stashbusting quilt after all! You are going to be so happy with yourself when it is complete. 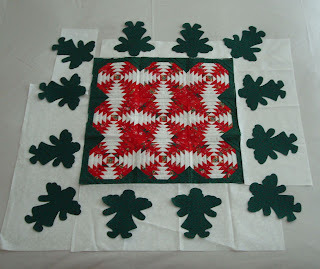 Wow, Bonnie, this quilt is amazing. It would make a lovely quilt for Christmas. Love the larger border, Bonnie, because even though the pieces in your pineapple are small, the overall effect is bold, don't you think? I'd try to use up those old reds on the pack if the border didn't take them all. Rags is looking so cute! But you are right 27 lbs is half of what Wally weighs and he isn;t as big as some bench springers. That quilt is absolutely precious; I can't wait to see the finished quilt! I like each of the border choices!